In the last episode of series one of Mad Men, Don Draper is coming up with copy to sell what will become the Kodak Carousel slide projector. He talks about the importance of ‘the new’ when selling a product. Then he introduces a caveat: there is also nostalgia – something he describes as ‘subtle, delicate’. Nostalgia, he says, is the ache of a wound that won’t heal. It’s a longing to return. But to what? A place? A home? A time? A way of being in the world? For Don Draper – a free-falling man on the brink of divorce – it’s a time when he was loved. My sequence Cave Time and Sea Changes is certainly infected with nostalgia. There’s no argument to be won or lost over this. It forms part of a project I began when I reached 40. When we are very young, we are primarily creatures of the present. Then we develop desires and ambitions, and we start to fixate on the future. From midlife we have to face the reality that we are living, more and more, with the past – our own past. It grows year by year, just as our future becomes a shrinking prospect. There’s an edge to this realisation; a potential crisis. Flamborough Head is on the Yorkshire coast. It was where my family – when we were all together – went for our holidays through the 1970s. In fact, it was nearly the only place we went for our holidays. The holidays stopped in the early 80s. My parents divorced in 1986. I didn’t return to Flamborough until after more than 20 revolutions of the calendar. 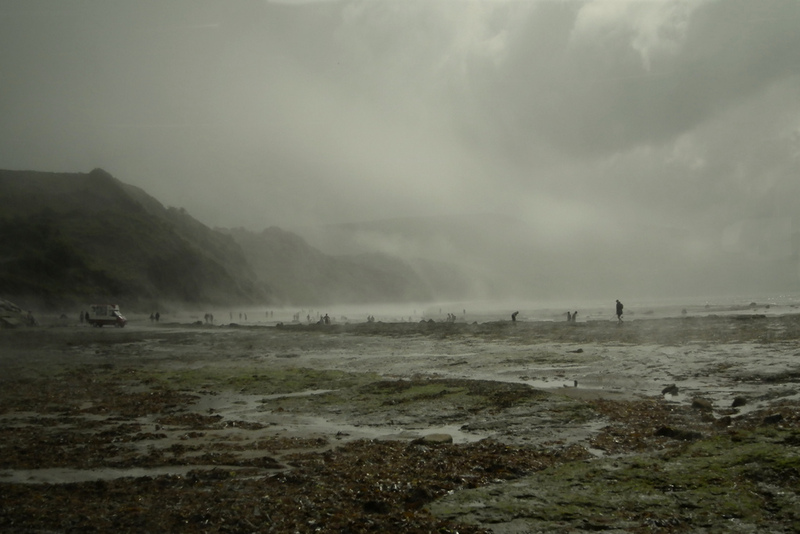 Around 2003 my mum moved to Flamborough – and so I started to revisit. But it wasn’t until 2007 that I rediscovered the sea cave at the North Landing. Previously, whenever I visited that bay, the tide seemed to be high; and the cave obscured and inaccessible. Proust says: ‘The past is hidden somewhere outside the realm, beyond the reach of intellect, in some material object (in the sensation which that material object will give us) which we do not suspect. And as for that object, it depends on chance whether we come upon it or not before we ourselves die…’ The cave was such an object for me. When I eventually walked back in there, I was walking back in time. Memories came in force. Karl Hurst’s photographs of the east coast are full of strange and familiar materiality. He is using the visual field to take us beyond the confines of the purely visual. They are tactile photographs. They have texture and feel. They get up and out at the crack of dawn and take you close to their subjects. Sometimes they take you so close that scale and perspective are lost, and pure physicality becomes an alien landscape. At other times, they step away and give you a view so resonant and familiar it is like restoring a scene from your own past – a scene you never quite experienced at the time. I love this. The photos work like poetic imagery: they catch the light of nuance; carry the freight of contradiction and paradox. Somewhere in my sequence a boy loses a toy fire engine on a beach. The fire engine is a childhood fetish – a symbol, perhaps, of a safe and cosy world. He loses that fire engine because he becomes absorbed by the landscape around him – the world beyond the fetish. At 43, the falling man in me – the Don Draper – faces the opposite scenario. It’s the physical world he risks losing. He can lose it in the library, on the internet, in the classroom or at the desk. He even risks losing it in the exhibition space; through sitting down to conceptualise it.